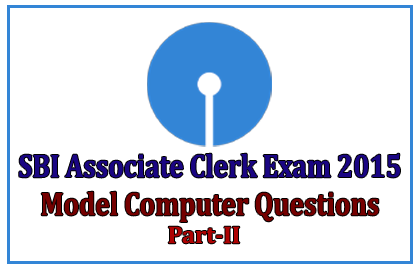 List of Model Computer Awareness Questions for Upcoming SBI Associate Clerk Exam 2015 were given below. Candidates those how are preparing for those exams can make use these set of model questions to score more marks. 1).what is the capacity of program counter? 2) The process of transferring of files from your computer to the computer on the internet is called? 3).Timing and control unit is a part of an? 4).Which is the common name of chip? 5).which is developed specifically for a distinct industry? 6).Which of the following services is not provided by internet service provider? 7).which language is used to write a source program? 8).The standard USB 2.0 Device transfer rate is? 9).The control part of a disk is known as? 10).Which of the following languages is used for process control?